We’d love your help. Let us know what’s wrong with this preview of It Wasn't Me by Dana Alison Levy. The Breakfast Club meets middle school mystery in this story of six very different seventh graders forced together in the aftermath of a vandalism incident. 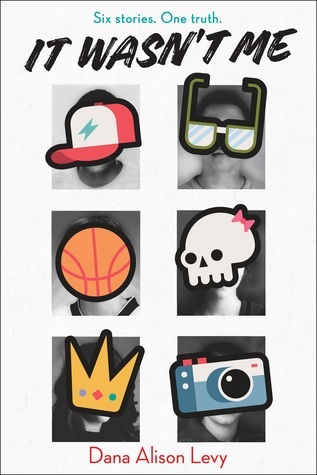 Theo does The Breakfast Club meets middle school mystery in this story of six very different seventh graders forced together in the aftermath of a vandalism incident. To ask other readers questions about It Wasn't Me, please sign up. For those who have read this: the cover reminds me of Karen McManus' great book "One of Us is Lying". Is this book a take-off of hers or does it stand on its own merits? Dana Levy Hey there! Author Dana here, and I will just say that my book IT WASN'T ME is intended for younger reader's than Karen's fabulous book. IT WASN'T ME…moreHey there! Author Dana here, and I will just say that my book IT WASN'T ME is intended for younger reader's than Karen's fabulous book. IT WASN'T ME is about a group of seventh graders, and is considered a Middle Grade novel, not Young Adult (so for 9-14-year-olds, rather than older teens). Both of our books -- and many others -- give a nod to the classic teen movie from the 80s, The Breakfast Club, but other than that they are not connected. As for the covers...both Karen and I are published by the same publisher, Delacorte Press, and I think they liked her cover so much they took inspiration for my book! (Authors don't get to design or choose their covers, so it was a surprise to me when I first saw it). Anyway, hope that answers the question. Happy reading! Dana Levy Hey Callie! This book was a pretty quick one to write. (Not all books are...I have one coming out in 2020 that took over five years!) But it took me…moreHey Callie! This book was a pretty quick one to write. (Not all books are...I have one coming out in 2020 that took over five years!) But it took me two or three months to write the first draft of It Wasn't Me. The first draft is only the beginning, though. Once I've finished a first draft it goes through many rounds of revision, first by myself, then with my editor. So that's another six months or so! Then of course, the process of turning it into a book (design, copy-editing, production, etc.,) takes longer again. In some ways, writing the story is the quickest part. Hope this answers your question. As mentioned in my RECKLESS CLUB review (https://www.goodreads.com/review/show...), I love THE BREAKFAST CLUB, so when I heard about this book, I instantly requested it. And once I got the acceptance email, I was super excited and immediately started reading it. Let me tell you, my friend, that I flippin’ loved it. Like THE BREAKFAST CLUB, you have the classic Princess (Molly Claremont), Athlete (Erik Estrale), Brain (Andre Hall), Criminal (Jax Fletcher), and Basket Case (Alice Shu) - this time labeled as the Overachiever, the Jock, the Nerd, the Screw-up, and the Weirdo - and they do excellent justice to their similar counterparts. And the book is complete with some iconic quotes and scenes from the original BREAKFAST CLUB. So, yeah, perfect for fans of THE BREAKFAST CLUB, or even people who want a nice, feel-good middle-grade novel. Fan's of Breakfast Club are going to enjoy this book. Steals quite a bit from the movie, but it's ok, I can handle that nod to a great film. I think middle schoolers through adult fans are going to enjoy this little mystery story Dana Levy nailed it! I expected this to be much more of a mystery. There's a mystery element, but it's really a group therapy book. But an interesting twist on that (restorative justice circle) and the characters are fun (I love Alice!). Seriously, this showed up in the mail at work, I grabbed it, started it, finished it. All in the same day. I won't say too much this far from pub date, but this is another win by Levy who, as usual, handles difficult issues with humor, charm, characters who are relateable and easy to become attached to (as well as coming off as full fleshed out), and a deft touch in general. This is definitely the "heaviest" of her books, facing issues of bullying, family difficulties, and general social issues a little more head-on, kind of in the style of John David Anderson or Rob Buyea - and arguably gets a little more "preachy" than her others, but it's also a kind of contemporary, middle school Breakfast Club which is pretty awesome. And I love that it's still in Shipton. 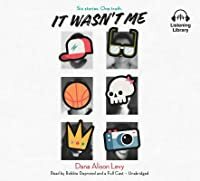 It Wasn't Me by Dana Alison Levy will draw readers in with the nod to The Breakfast Club and keep them interested with the modern take on dealing with school labels. Like Theo I struggled wanting to know and not know what really happened to his vandalized artwork. Great book that will help readers to "Be kind, for all of us are fighting unseen battles." I generally like Levy's work, but I don't know that my students will really get the heavy Breakfast Club references. Also, I couldn't believe that a guidance counselor would be allowed (or want to!) have a group of students in during spring break for a week long justice circle, so it was hard for me to get invested in the concept. I can see this doing well in many libraries, but I think I will pass on purchase for mine. Still featuring one of the Fletcher boys—Jax—but told by Theo, whose photos have been vandalized multiple times. One of the teachers at the school decides to do justice circle over spring break to get to the bottom of it. It starts slow, as we have to fully get into the story from six different points of view. Levy does a wonderful job of giving each of these characters a full story. That is the point, that they all learn that even if on the surface you are different, everyone can find something Still featuring one of the Fletcher boys—Jax—but told by Theo, whose photos have been vandalized multiple times. One of the teachers at the school decides to do justice circle over spring break to get to the bottom of it. It starts slow, as we have to fully get into the story from six different points of view. Levy does a wonderful job of giving each of these characters a full story. That is the point, that they all learn that even if on the surface you are different, everyone can find something in common. Thank you to Dana Alison Levy for providing an ARC to collabookation for review. It Wasn't Me is a Breakfast Club WhoDunIt? And it's amazing. Theo was asked and reluctantly agreed to hang some of his photography in the middle school’s art gallery. Soon after it is hung, it gets cruelly vandalized. Theo may have been able to deal with that, he knows the people he goes to school with, after all. Did he expect any different? But the following day, someone ruins a different piece of work he's set up. Thank you to Dana Alison Levy for providing an ARC to collabookation for review. Theo was asked and reluctantly agreed to hang some of his photography in the middle school’s art gallery. Soon after it is hung, it gets cruelly vandalized. Theo may have been able to deal with that, he knows the people he goes to school with, after all. Did he expect any different? But the following day, someone ruins a different piece of work he's set up...and now it's personal. This book is the story of what happens when the five suspects and Theo all agree to spend their weeklong vacation taking part in a Justice Circle. This book is fast-paced and so compelling. Turns out, when you spend several days stuck in a room with five other people, you get to know them. You definitely get past their middle school personas. It starts to get real in that Justice Circle. The entire time, I was simultaneously trying to figure out who did it while (for EVERY character) hoping that person didn't do it! Levy does a wonderful job of showing the reader the different exteriors and interiors for each and every character, and we understand them. I think we all can go back and shudder at who we were in middle school, or things we did. Levy perfectly displays these characters’ hopes and imperfections. Even better, Levy somehow highlights each character's introspection without getting too idealistic. Kids will love this fast-paced and suspenseful read, as will adults. I think my fifths will miss a lot of the social aspects that are touched upon, but will still be thoroughly entertained. I picture my returning seventh and eighth graders being able to identify and connect with all the complex social issues of middle school, and for this reason I'll have two copies! It Wasn’t Me will be published in November, but you can (and should) preorder now! I am a huge fan of The Breakfast Club. My sister and I can recite the entire movie. Just ask my teenager: when I introduced it to her for the first time (a rite of passage, obviously) I ruined it by saying the lines with the characters. So imagine my UTTER EXCITEMENT to see a middle grade book paying homage to the Hughes classic. I couldn’t wait to get my hands on it, and am grateful to the author and publisher for the ARC. I read It Wasn’t Me in a day, loving the mystery parts of it, as well as I am a huge fan of The Breakfast Club. My sister and I can recite the entire movie. Just ask my teenager: when I introduced it to her for the first time (a rite of passage, obviously) I ruined it by saying the lines with the characters. So imagine my UTTER EXCITEMENT to see a middle grade book paying homage to the Hughes classic. I couldn’t wait to get my hands on it, and am grateful to the author and publisher for the ARC. Think The Breakfast Club meets middle school. Theo’s self-portrait artwork has been vandalized, and he (along with 5 suspects) have to meet daily over winter break to talk about what happened. Good book for MG readers as it addresses the assumptions and judgements they so often make and fall victim to at this age. Good information about Restorative Justice, too! This had me hooked from the start! A teacher holds daily sessions with a group of middle schoolers in order to implement "restorative justice" in hopes that one of them will confess to a bullying incident and that they'll all be able to put this behind them. This would make a good follow-up suggestion for students who like Jackie Woodson's Harbor Me. Wow. This book is everything. After Theo’s artwork is ruined at school, a counselor decides to use Restorative Justice. I loved how The Breakfast Club helped to inspire this novel. If you teach middle school, this book is a must. Review forthcoming in School Library Journal! Please see my review at Amazon.com under C. Wong. Thank you. When i started this book i had ZERO EXPECTATIONS . but what a book it was!!! This book!! every parents should read it and ask the kids to read it. It's a simple but eyeopening book. which pinpoint's the Bullying, be it at school or at home or at anywhere. So the story is Theo in who's point of view story has been told, becomes victim of school bullying, there are five kids at the scene: The Nerd, the Princess, the Jock, the Weirdo, and the Screw-Up. and all the 5 said same thin When i started this book i had ZERO EXPECTATIONS . but what a book it was!!! but some one has seen something!! to make a confession one of the teacher (Th sweetest i have known) Ms. Lewiston starts an activity for a week known as Justice Circle which all the five accused and Victim has to attained and open up about the incident. through the week all this six kids who thinks they know each other, will understand that they really have no idea about each others and will learn grate many other things. The book has written in simple language,it's funny, it's up to the point. the thing i like about the book is it will make us understand other human being much better. It was like reading the Breakfast Club if it were a book instead of a movie. The author doesn't hide the comparison (in her author's note at the end), and I guess certain ideas are timeless. I have long been interested in the idea of restorative justice, so I enjoyed seeing how the process changed the minds of all the characters. Two criticisms I have are that the voices just didn't sound like middle schoolers. I listened to it, but I'm not talking about the narrators' voices. I mean, what the ch It was like reading the Breakfast Club if it were a book instead of a movie. The author doesn't hide the comparison (in her author's note at the end), and I guess certain ideas are timeless. I have long been interested in the idea of restorative justice, so I enjoyed seeing how the process changed the minds of all the characters. Two criticisms I have are that the voices just didn't sound like middle schoolers. I listened to it, but I'm not talking about the narrators' voices. I mean, what the characters said just made them sound more like high school students. Second, in the publisher's description of the book, the book is described as having a "prank twist." Unless I'm misunderstanding what that means, this does not happen. The author puts enough clues as we go along that the resolution is not surprising in any way. This is a perfect middle school book...no bad language or inappropriate content. It makes us think about how others see us and how we see ourselves, but not in a heavy-handed way. 1. I think this succeeds in its attempt to reinterpret themes from The Breakfast Club for a younger audience. The point is to see past the labels we put on people. To know that everyone is fighting unseen battles. Kids from different cliques can and should get to know each other better. 2. I don't know much about restorative justice, so I can't speak to how well it was portrayed in the book. What I can say is that the concept slows down the book with didactic passages but ultimately enriches the story. 3. There are some big coincidences that make this pretty unsatisfying as a mystery. Obviously, the premise makes you want to read to the end to find out who really did it. But this book is way more about relationships than plot. Took me 3 hours and 07 minutes to complete this read. And yes, I’m still sitting in the same chair. But at least I changed my pants. I also beat my time for reading this book because of a website I’ve been using for a little over a year now. It’s called “howlongtoreadthis.com” and it’s amazing! The website told me it’d take me 4 hours and 01 minute to read IT WASN’T ME but I beat that! Don’t you love beating yourself at things? This is one of those books that I loved and that I would buy for my Took me 3 hours and 07 minutes to complete this read. And yes, I’m still sitting in the same chair. But at least I changed my pants. I also beat my time for reading this book because of a website I’ve been using for a little over a year now. It’s called “howlongtoreadthis.com” and it’s amazing! The website told me it’d take me 4 hours and 01 minute to read IT WASN’T ME but I beat that! Don’t you love beating yourself at things? This is one of those books that I loved and that I would buy for my shelf. The characters, storyline, problems, and resolutions were all things I thoroughly enjoyed. It was YA and set in middle school so that’s probably why it was so clean but it was also soooooo good. At times I didn’t even remember that these characters were in middle school. Such a fun (and topical) remake of Breakfast Club! Theo's school photography display has been destroyed in an attack that feels quite personal, and no one is admitting to anything. In order to try and discover what happened and why, a teacher gathers Theo and five student suspects together for a week long justice circle meant to reveal the truth and heal the underlying damage that caused & resulted from the incident. Yeah...Theo and the others aren't buying it either- but before long, all the students will find that there might be something to this restorative justice concept. New connections are made, perspectives are changed, surprises abound, and plenty of laughs and high-jinks ensure. It's a darn good time, with a nice underlying message to boot. Highly recommended. This digital ARC was obtained through Netgalley, with thanks to Random House Children's/Delacorte Books for Young Readers, in exchange for an honest review. It Wasn't Me reminded me of the high school thriller, "One of Us is Lying," and Breakfast Club set in a middle school with no death...just bullying and no one fessing up to the vandalism of the main character's photography. Quick mystery read with a few red herrings thrown in so the reader is kept guessing to the very end! This was really good! I did not suspect the ending at all. Great for younger readers that want to read One of Us is Lying. Lots of interesting things to talk about & discuss. I really liked all of the characters & am glad I got to know them. Looking forward to discussing with my 7th & 8th grade book club. What I wanted Harbor Me to actually be. This book is a perfect younger YA book. It's adorable, funny, and has a good message. All things I wish I could find more in YA. It was a refreshing take on the old movie The Breakfast Club (Which makes me old, because I saw it when it first came out! 😂). I highly recommend this book. I had a hard beginning this, and was afraid it was a bunch of kids whinning about detention. However, I realized it was modeled after a favorite 80's movie! The end and resolution was great! Levy, Dana Alison. It Wasn't Me. Delacorte Press, 2018. Theo's photography project is vandalized, and no one saw anything. There are five students who were in the vicinity at the time, and they all claim they didn't do it. During a week of school break, the five students and Theo participate in a "justice circle" at school to discover who ruined Theo's work and why; during this time they learn more about each other than they do about the incident. This book has been touted as a remake of The Break Levy, Dana Alison. It Wasn't Me. Delacorte Press, 2018. This book has been touted as a remake of The Breakfast Club, and that's a fairly accurate statement. The accused kids have all been labeled by Theo - the screw-up, the weirdo, the nerd, etc. - and through the justice circle he comes to care more for them than he does for the truth. Unfortunately, this story has the feel of an after-school special, and the focus on the characters rather than on action or plot will possibly bore tween readers. It's an interesting concept; however, this book seems to be aimed more at adults who remember watching The Breakfast Club or who are skeptical of the concept of a justice circle than at tweens who should be the intended audience. Read one of Levy's other books, such as the Family Fletcher Takes Rock Island, instead. An eye-opening book that tells 'There is always more to the story than meets the eye." When you are bullied, not once but thrice, then you have to sit in a room of suspected students who might have bullied you, will you do it? If you love a little mystery, I'm sure you'll enjoy reading It Wasn't Me. The plot is actually simple. It is about a group of students who were involved in a vandalism incident. Each one of them was asked to spend the vacation week together to get to know the "truth." The bo An eye-opening book that tells 'There is always more to the story than meets the eye." If you love a little mystery, I'm sure you'll enjoy reading It Wasn't Me. The plot is actually simple. It is about a group of students who were involved in a vandalism incident. Each one of them was asked to spend the vacation week together to get to know the "truth." The book is told through Theo's POV. Even though the story is quite simple, it didn't stop me from guessing who the perpetrator was. I like the internal conflicts that the characters had faced in this story. Also, it includes a lot of tough important questions about the 'labels' we put into each other. The author brilliantly did writing sensitive issues with the heart, humor, and youth's voice. Levy also did a great job providing each character's backstory which some people can relate to. Overall, It Wasn't Me is a sweet, heartwarming book that teaches its readers to be kind for everyone has unseen battles. Dana Alison Levy was raised by pirates but escaped at a young age and went on to earn a degree in aeronautics and puppetry. Actually, that’s not true—she just likes to make things up. That’s why she always wanted to write books. She was born and raised in New England and studied English literature before going to graduate school for business. While there is value in all learning, had she known she Dana Alison Levy was raised by pirates but escaped at a young age and went on to earn a degree in aeronautics and puppetry. Actually, that’s not true—she just likes to make things up. That’s why she always wanted to write books. She was born and raised in New England and studied English literature before going to graduate school for business. While there is value in all learning, had she known she would end up writing for a living, she might not have struggled through all those statistics and finance classes. THE MISADVENTURES OF THE FAMILY FLETCHER is her first published novel, but she has a trunk full of other attempts, which vary in degrees of awfulness.